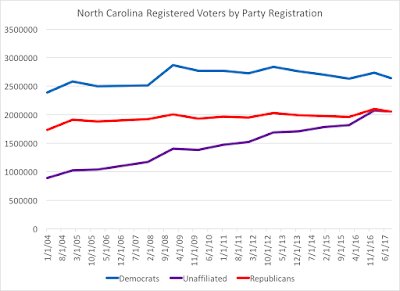 It was this past Saturday that many who track NC politics had been waiting for--well, maybe 3 or 4 of us, but we saw it coming. 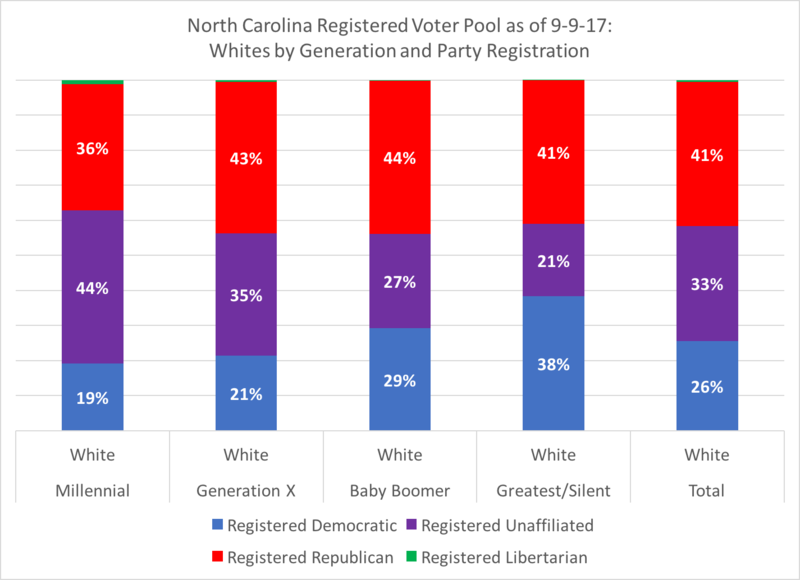 Saturday's NC State Board of Elections data file showed that registered unaffiliated voters now outnumber registered Republicans statewide, and working towards the level of registered Democrats. 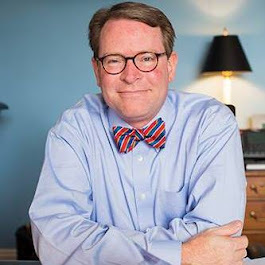 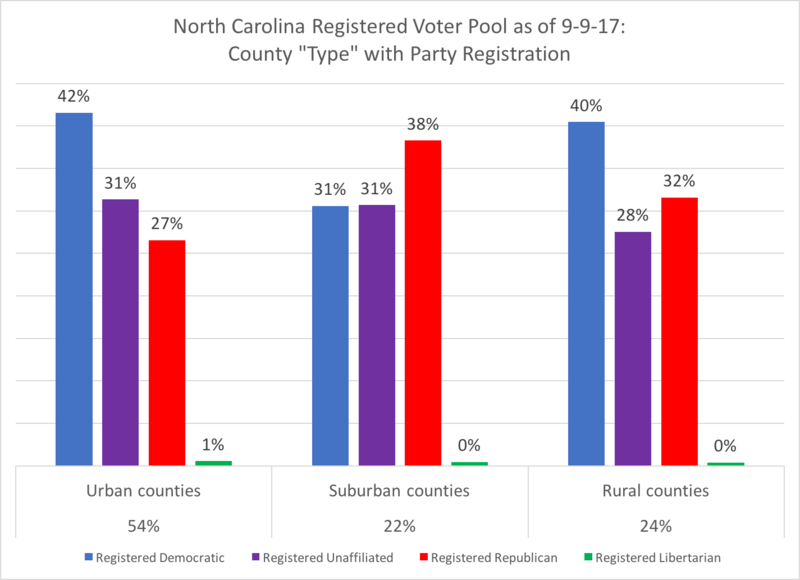 In looking at the September 9, 2017 data of the 6.7 million registered voters in the Old North State, registered unaffiliated voters were a total of 55 voters now above registered Republicans, marking the first time in the state's history that one of the two major parties was surpassed by voters who eschewed a party label in their voter registration. 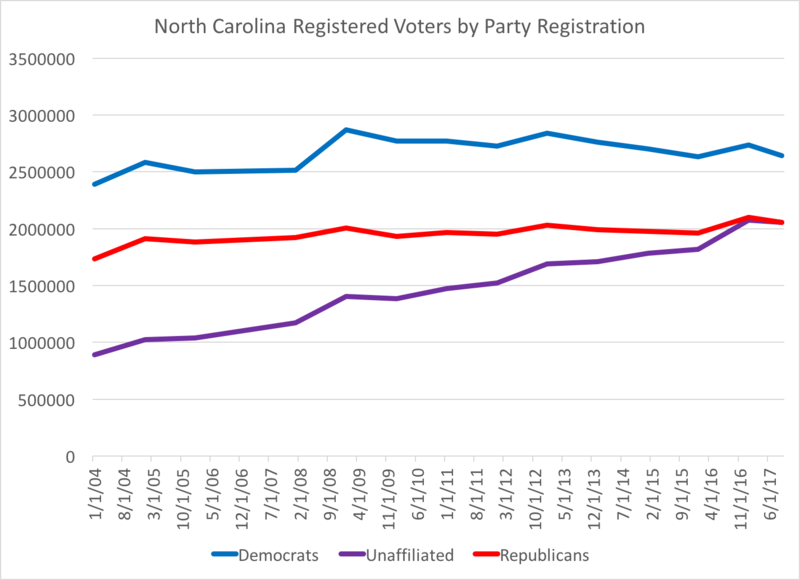 So a couple of questions: first, where did this "rise of the unaffiliated" come from? Back in 2004, registered unaffiliated voters were only 17.7 percent of the pool, while registered Democrats were 47.6 percent and registered Republicans were 34.5 percent of the 5 million registered citizens. 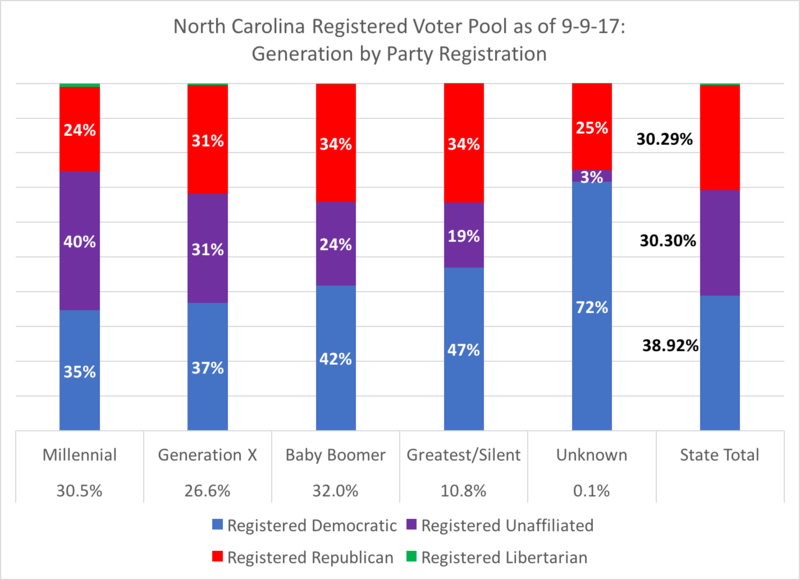 Fast forward to September 9, 2017, and the 6.7 million registered North Carolinians break down into 39 percent registered Democrats, 30 percent registered unaffiliated, and 30 percent registered Republicans. 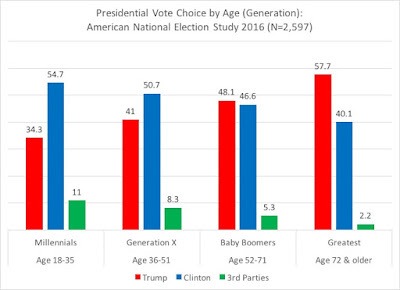 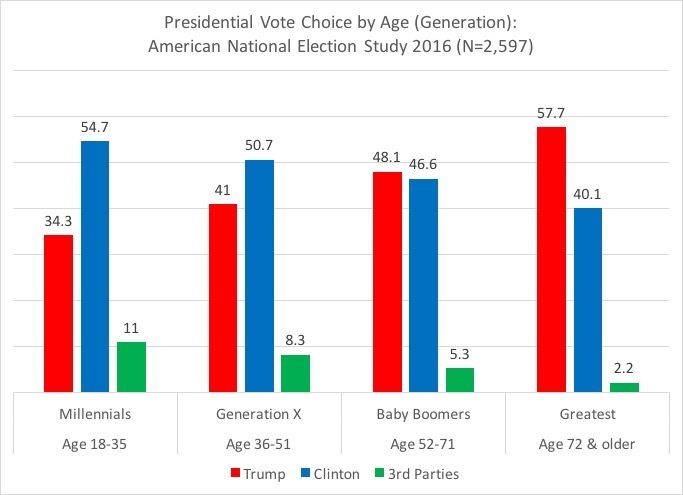 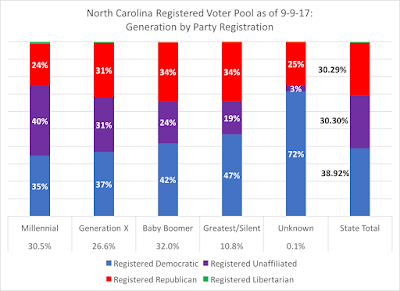 Registering Millennials are breaking with both political parties and registering unaffiliated at 40 percent, while the generational cohorts have smaller middle bands of unaffiliated registration. 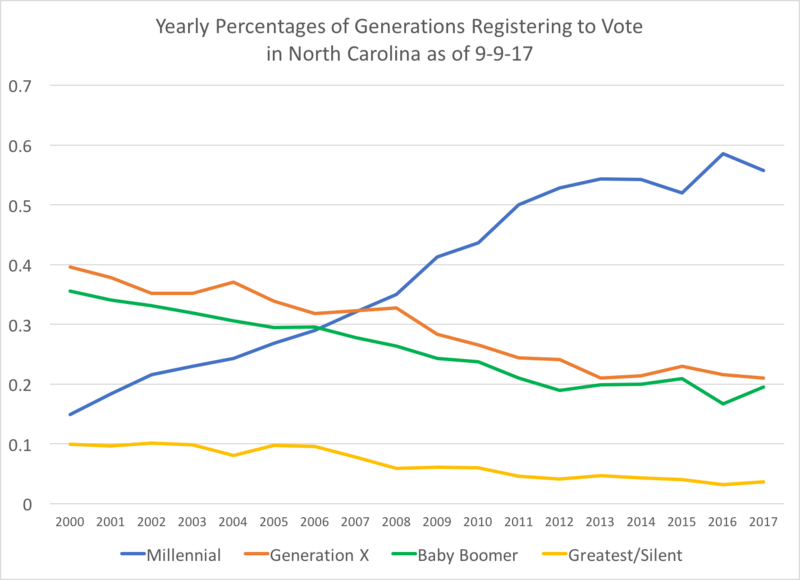 In 2016, almost 60 percent of North Carolina's voters who registered that year were Millennials. 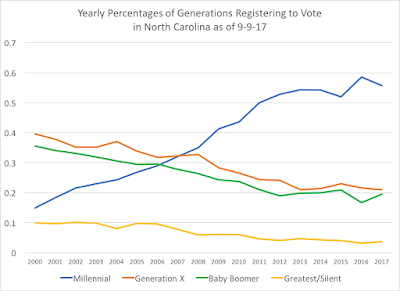 Millennials in urban counties should not surprise anyone, since research has tended to show that this generation prefers high density areas. 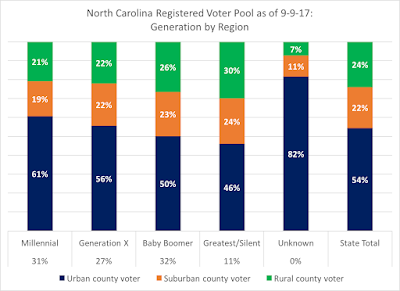 Conversely, 54 percent of the Greatest & Silent generations prefer rural and suburban counties. 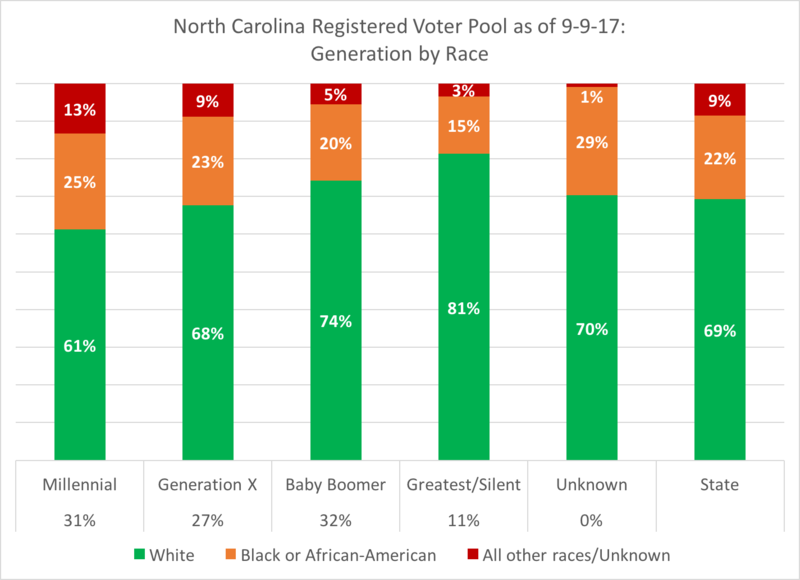 Millennials are the most racially diverse generation, and that is reflected in the fact that 38 percent of registered Millennial voters are non-white. 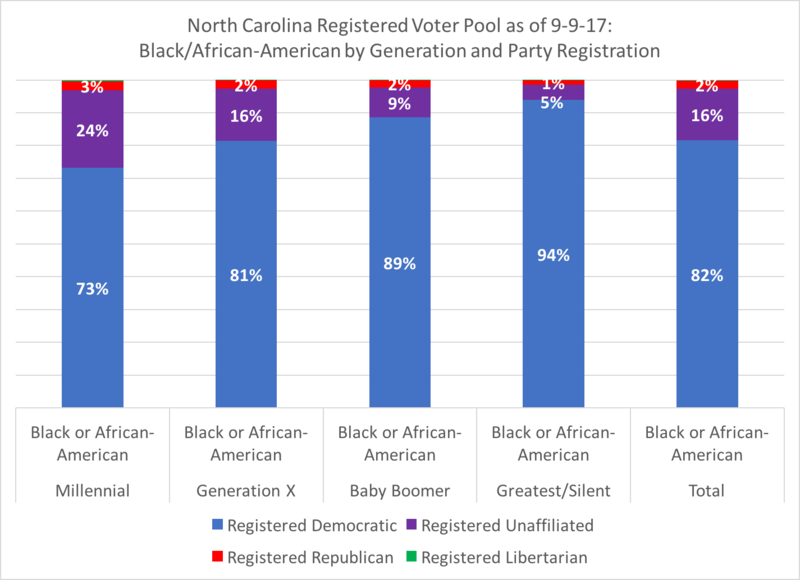 While their voter registration shows less than three-quarters of black NC voters registering with the Democratic Party, their voting patterns tend to show strong allegiance to Democrats. 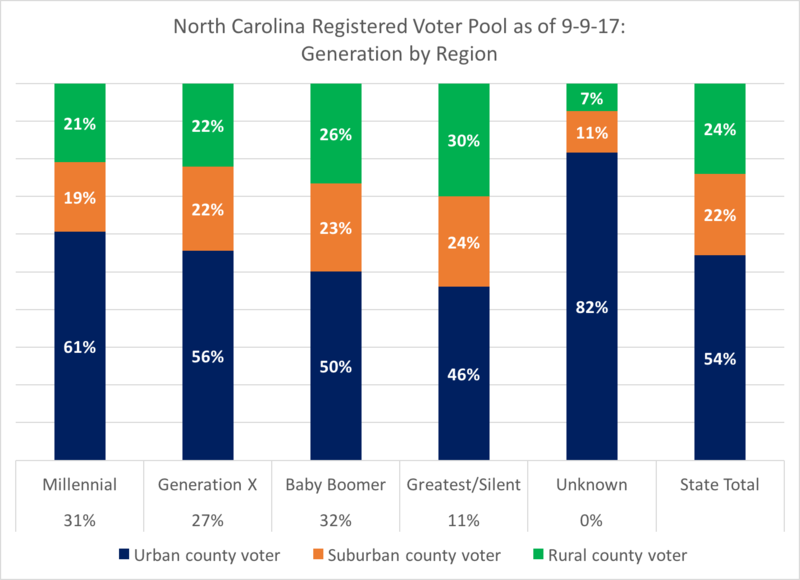 Unaffiliated voters are second within urban counties and suburban counties, making Republicans third in urban counties and Democrats third in suburban counties. 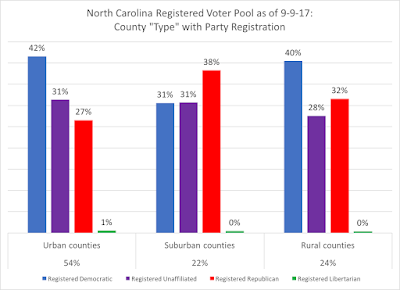 Only in rural counties are unaffiliated voters trailing the two major parties in registration. 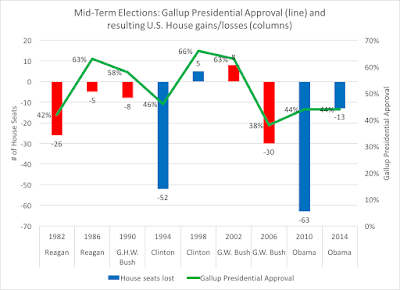 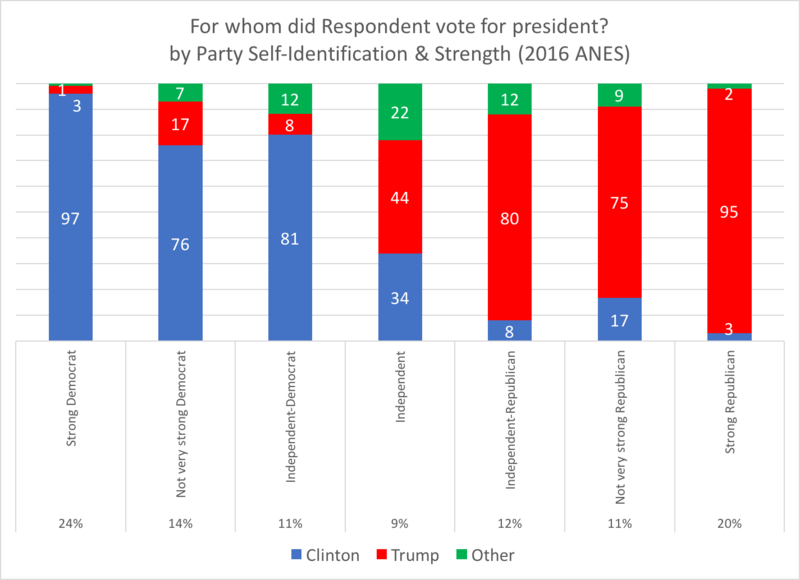 This trend of independent leaners being "faux independents" has been with us for some time, and the true national percentage of independent independents is typically 10 to 15 percent in a presidential election. 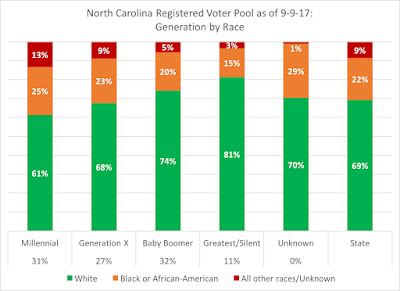 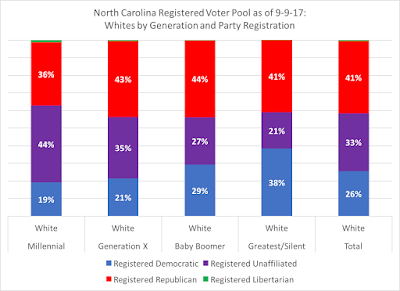 So, while unaffiliated voters in North Carolina are the fastest growing group among registration, the clarification of (at least thinking that North Carolina may, in some ways, reflect some of the trends of the nation), it is important to consider whether they truly are "unaffiliated" in their partisan allegiances, or whether they simply eschew the party label, but cast their ballots in secret as partisan as the next generation.